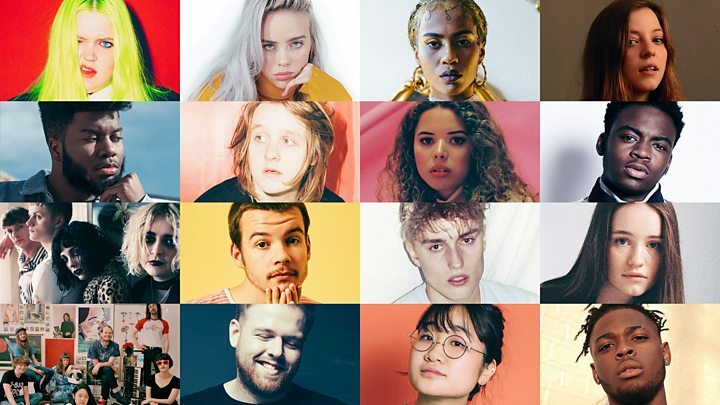 The next generation of potential pop stars have been highlighted by the BBC Music Sound of 2018 longlist. Sixteen emerging artists have made it onto the list, now in its 16th year, which has previously included names like Adele, Frank Ocean and Dua Lipa. This year's crop includes the youngest ever nominee, 15-year-old US pop singer Billie Eilish. She's joined on the list by two other teenagers, rising R&B star Khalid and singer-songwriter Rex Orange County. Their names were selected by a panel of 173 music experts, including critics, broadcasters and DJs. For the first time, the panel also included former nominees, including Stormzy, Ellie Goulding, Years & Years frontman Olly Alexander and last year's winner, Ray BLK. After a couple of years where grime and UK rap featured heavily on the longlist, this year's selection has swung back to pop. Is Billie Eilish pop's best new hope? Mononymous Scandipop artists Sigrid and Alma are both tipped for success, alongside experimental eight-piece Superorganism, whose members hail from the UK, Japan, Australia and New Zealand. Eilish, meanwhile, has become known for her twisted take on pop, notably on the single Bellyache, where she casually imagines murdering her friends over a backing of acoustic guitar and gut-churning synths. Hackney-born rapper Not3s also makes the cut, thanks to his viral hit Addison Lee, while indie four-piece Pale Waves, who have been championed by The 1975, look set to break into the mainstream after building a cult following in Manchester. Radio 1's Annie Mac said she was "super excited" to see so many "young and innovative artists" on this year's longlist. "Some acts will be brand new to UK audiences and many have already started to make an impact," she said. "I can't wait to be a part of their journey and see what the year ahead has in store for them all." The top five will be revealed in January on BBC Radio 1 and BBC News, with one artist announced each day from Monday 8 January. The winner will be revealed on Friday 12 January during Clara Amfo's show on Radio 1. Billie Eilish: Is she pop's best new hope?